College Park, MD – On Wednesday November 14, 2012, over 350 Maryland middle school girls attended the annual "Cool Careers Cybersecurity for Girls Summit" at University of Maryland, College Park. The event was co-organized by the Maryland Cybersecurity Center (MC2) and CyberWatch K-12 Division, and sponsored by Google and Educational Technology Policy, Research, & Outreach. Throughout the day, the girls rotated through different hands-on activities, all relating to solving an identity theft case of cybercrime. 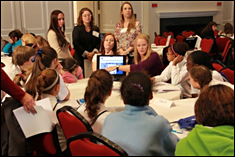 At each station, the girls learned from female Cybersecurity professionals and leaders, including representatives from Lockheed Martin, Northrop Grumman, the National Security Agency (NSA) and the Department of Defense Cyber Crime Center (DC3). The keynote speaker for the event was Dr. Jennifer Golbeck, a UMD assistant professor in the Computer Science Department and College of Information Studies. Dr. Golbeck spoke to the girls about her experience studying Computer Science as a female, and encouraged them to challenge gender stereotypes and gender norms facing women who are studying STEM (science, technology, engineering, and math) field. MC2 and CyberWatch plan to continue holding this event every fall at the UMD campus. MC2 partners with government and industry to provide educational programs to prepare the future cybersecurity workforce, and develop new, innovative technologies to defend against cybersecurity attacks. CyberWatch K-12 Division creates programs to expand knowledge in cyberawareness and cybersecurity.